Emerson in his book explained that not every square inch of a photograph had to be sharp. That it was possible by selective focus or his term “differential focusing,” to break a photographic canvas into the near, middle and far by using sometimes a “shallow depth of field.” Eugéne Atget who probably had no idea who this English aristocrat was (Emerson’s father made a fortune growing sugar cane in Cuba) took the matter of depicting space into the 20th century while photographing the Paris environs. Atget understood better than Emerson that it wasn’t depth of field or organizing near, middle and far which depict space in a photograph, but what the photographer pointed his camera at. Eugéne Atget’s work is all about how a picture plane should behave when you choose your subject matter wisely. See, “Gathering Water Lilies,” (1886) Page 10, Peterson, Peter Henry Emerson and American Naturalistic Photography, 2008, ISBN 978-0-91296-498-0. 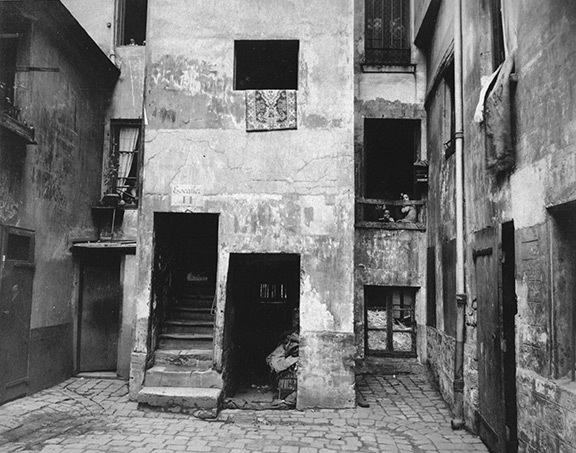 See, “Cour, 41 rue Broca,” (1912) Page 127, Szarkowski, Atget, ISBN 0-87070-094-4.